This solar floating lily waterfall fountain needs no wiring; just place it on the water's surface, as the sun shines on the solar panel the pump starts to work producing an eye-catching water display to your garden pond. 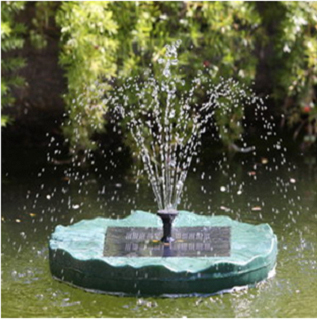 This solar floating lily fountain is designed to use energy from the sun to operate the pump during the day. The power operates its pump to create a shower spray, which will add a delightful sight to your pond.